The Awá, also known as the Kwaiker or Awa-Kwaiker, are an ancient indigenous people of Ecuador and Colombia. They primarily inhabit the provinces of Carchi and Sucumbíos, in northern Ecuador, and southern Colombia, particularly the departments of Nariño and Putumayo. Their main organization is called UNIPA (Organización Unidad Indígena del Pueblo Awá, English: Awa Unity of Indigenous Organization). 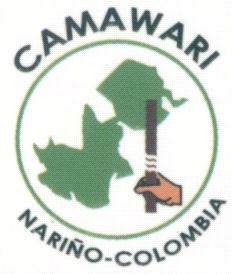 Another internal organization is CAMAWARI (Asociación de Autoridades Tradicionales indígenas Awa de Ricaurte - Cabildo Mayor Awa de Ricaurte, English: Association of Traditional indigenous Awa Authorities of Ricaurte - Council Awa of Ricaurte) (logo), their representation in the city of Ricaurte. Their main leaders are called Governors. A horizontal flag, with four equal horizontal stripes (from top to bottom: red, yellow, white and green); there’s also a variant without logo, as seen here. also a variant with a smaller logo (source). The ratio variation in witnessed photos of actual flags in use suggests that ratio observance is lax for this flag — indeed not unlike other flags made of horizontal stripes: The cases of Cabo Verde, Catalonia, or the Gay Pride / Rainbow Flag come to mind. The flag of UNIPA is a horizontal flag, with four equal horizontal stripes (from top to bottom: red, yellow, white and green) and the logo in the middle as seen here (source). Here’s an image of this flag (source). It is also ~3:4, and the diameter of the logo just under half of the flag’s height (leaving a small gap above and below the two middle stripes it is centered on). It also includes lettering on the green stripe, centered and offset to the top — a motto set in two lines of bold heavy white serifless letters, reading: «Unidad, Territorio, Cultura y Autonomía», Spanish for «Unity, Territory, Culture and Autonomous government». Here’s also a variant with a smaller logo (source). The source photo shows a more oblong flag, around 3:5, and the logo disc diameter seems to be 1/4th of the flag’s height — i.e., the height of each of the stripes.